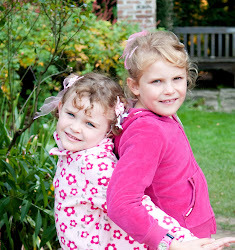 Phew, things have been a little crazy to say the least – I have a backlog of creative projects to blog about and no time to do it! Anyway, here are some photos of a cake I made for my friend Kerry’s birthday the other week. 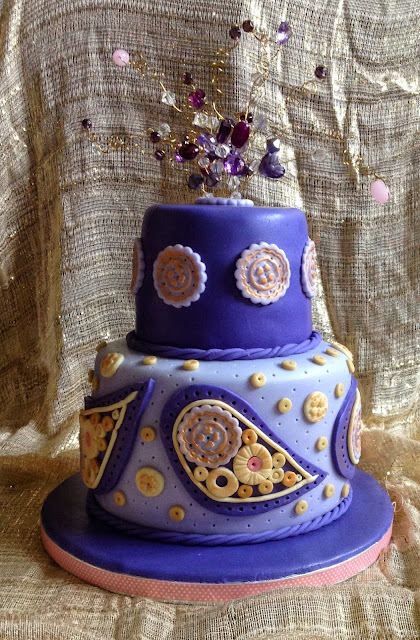 I wanted to try out using jewellery as a cake topper – I have seen some amazing designs by cake artists online, LindySmith for example. I have to say, I love the effects that you can achieve with a little jewellery wire and beads. I will definitely be using this technique again! delivered the cake and I had very little natural light! To create the topper, I selected a variety of purple tones and crystal beads in an assortment of designs and sizes then threaded them onto some 26 guage gold wire. I then looped the wire around the beads to hold them into place. 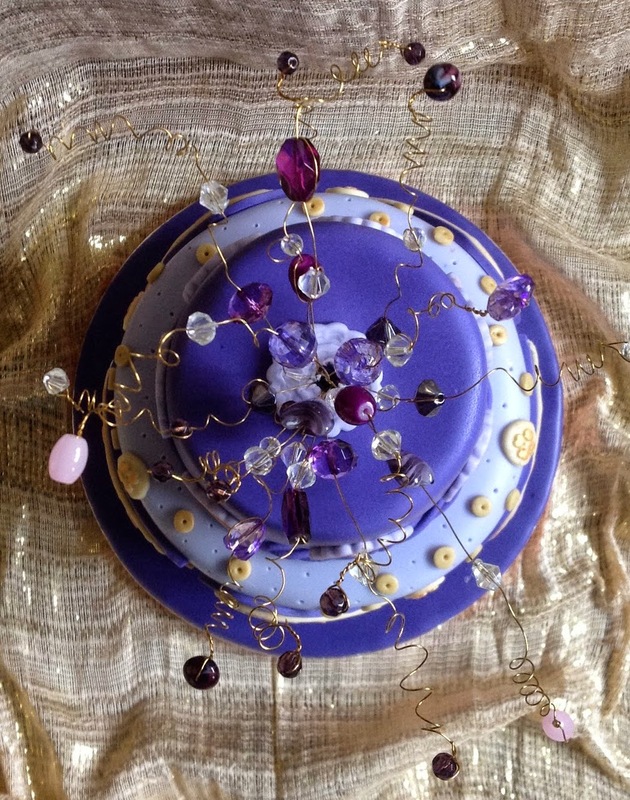 I made the twirly bits by wrapping the wire around a pen, then secured all the ends into a flower pic, which was already inserted into the cake. 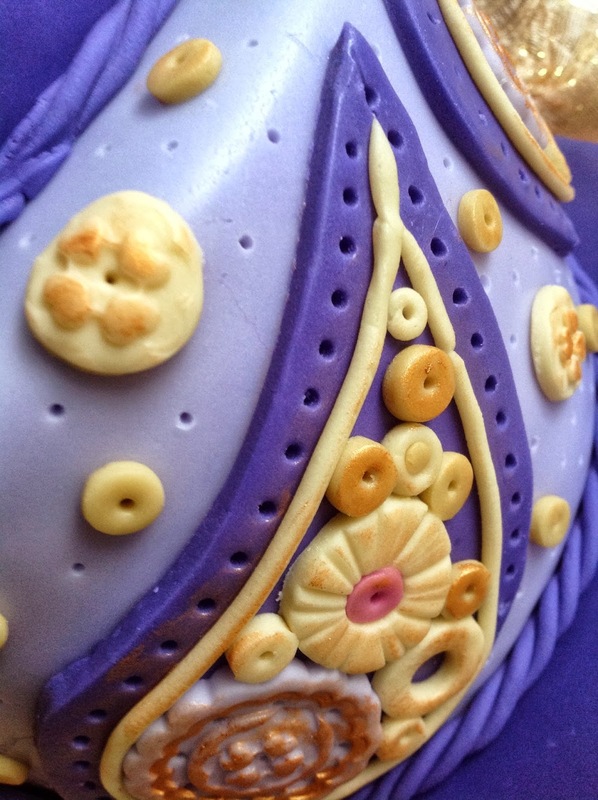 If you stuff the flower pic first with a little sugar paste, it will hold the wires steady. 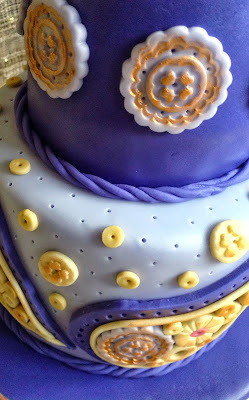 silicone molds and Little Venice Cake Company nozzles to create the paisley effect. I loved the dimensional result, but make sure you allow plenty of time for this technique as it can take ages! It must have taken forever!!!! and it looks far too good to eat! stunning cake. its a shame to cut it.